2. I would use it as a hard paced training run - a tempo run for ultras I suppose. I find it hard to push myself for so long on a training run so this would be ideal. I had a slightly easier week this week as I wanted to run the race hard - just one tempo run which I did on Tuesday and a coupe of hill sessions on the treadmill; I also cut one of my Saturday runs. Since the weather was horrid again this week I was pleased to be taking it easier. Total miles for the week were 73. Last year I made a right dogs dinner of this race, I set off too hard, partly because the start was crowded so I wanted to get around the crowds, partly I got carried away in a race situation and partly because I had no idea how to pace a 30km! I have run plenty of marathons so was thinking that as it's a lot shorter than a marathon it needs to be run a lot harder - I overdid this! At some point before half way I was slowing drastically and ended up with a 4 min positive split. This year I was determined to do a better job, not necessarily a faster time but a better paced race. I had no idea going into the race if I could run faster than last year as most my training has been 40-60s per mile slower than last years pace with the odd tempo run/interval session 60-90s faster - I had done nothing in the middle so was not sure of my ability to run at that pace and for over 2 hours! I have done some hill training but nowhere near enough due to my knee injury and needing to be careful. I find it hard to pace hilly races, I checked my Garmin after each mile and was running at a pace I thought was a bit too fast but maybe that was due to those miles having a net downhill, I wasn't sure if they did so had to go on how I felt which was that the pace was comfortably hard, I was able to chat a little with some club mates but wasn't keen on long conversations so I think that was about right. On the ups everyone was passing me as I crawled up, I kept the effort level about the same, a lot of people try to keep the pace the same but I know if I do that my legs and lungs will be screaming me at the top so I just run up steady and slow then would pass loads of people on the way down. Next hill the same people would pass me then I would pass them on the way down when I picked the pace right up. I never understand why people keep the pace the same on the down, why not make the most of the hill? There were a few small groups who got on my nerves a bit running two or three abreast taking up half the road so I had to go onto the other side to pass them, that is not ideal when you are flying downhill hill and have to change direction, a few times I would run between them but mostly they didn't quite leave enough space. I had to keep passing these same people on every downhill!! Got to halfway in 1.09 (last year 1.10) feeling quite good so thought I ought to beable to better last years time. By 10.5 miles I realised I had not had a gel so took a double caffeine one even though I didn't feel I needed it (that was my only gel of the race). With about 4-5 miles to go I realised that it was nearly done and I was feeling OK so made a bit more effort - I was being a bit cautious earlier after what happened last year. I was was now passing a few people going uphill and often those who I passed going down did not pass me again so I was working my way up the field. It is always a bit confidence booster when you are passing people in the later stages of the race. Finished feeling strong - such a different experience to last year - in 2.17.40 (average pace on Garmin 7.20mm) which was 7 mins faster than last year - feeling quite positive about London marathon now. I wore my Gorun2's which I have been using for speedwork. They are really light, I always feel fast in them! I wasn't sure if they would provide enough cushioning for the pounding my feet would get going hard downhill but they were just right. I was amazed at the number of runners around me wearing heavy weight shoes which slap hard on the pavement and are noisy when they run, I expected more people to be in racing flats or at least something a bit lighter. 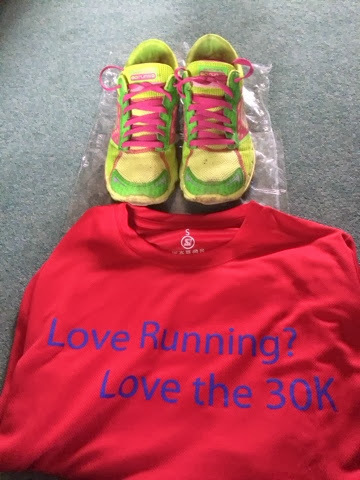 Stamford 30km is a great race - cheap to enter (£16); well organised; a testing run; useful goody bag (banana, chocolate bar, sports drink and love hearts! )and always a great technical long sleeved T shirt which makes a nice change from short sleeved which I have plenty of.